Coffee Conversations: Episode 44-A Dynamic Opportunity. Hosted by Diane Cunningham, Certified Life Purpose Coach with Pathways To Purpose Ministry. Theme music is "Unwritten" by Natasha Bedingfield. Special Thanks to Clifford Sound for providing the bandwidth for this podcast!! Coffee Conversations 43: Happy New Year! Happy New Year to all! We look forward to bringing you more great podcasts and conversations! Coffee Conversations: Episode 43-Happy New Year! Hosted by Diane Cunningham, Certified Life Purpose Coach with Pathways To Purpose Ministry. Theme music is "Unwritten" by Natasha Bedingfield. Special Thanks to Clifford Sound for providing the bandwidth for this podcast!! SORRY FOR THE MIXUP FOLKS! WE'LL BE TAKING THIS DOWN DUE TO AN ERROR IN THE PODCAST! WE'LL REPLACE IT WITH ANOTHER SOON! Coffee Conversations: Episode 42-Training for Life. Hosted by Diane Cunningham, Certified Life Purpose Coach with Pathways To Purpose Ministry. Theme music is "Unwritten" by Natasha Bedingfield. Special Thanks to Clifford Sound for providing the bandwidth for this podcast!! Coffee Conversations: Episode 41-Coaching on the Go. Hosted by Diane Cunningham, Certified Life Purpose Coach with Pathways To Purpose Ministry. Theme music is "Unwritten" by Natasha Bedingfield. Special Thanks to Clifford Sound for providing the bandwidth for this podcast!! Coffee Conversations: Episode 40-Ordinary Miracles. Hosted by Diane Cunningham, Certified Life Purpose Coach with Pathways To Purpose Ministry. Theme music is "Unwritten" by Natasha Bedingfield. Special Thanks to Clifford Sound for providing the bandwidth for this podcast!! Coffee Conversations: Episode 39-The Purpose Process. Hosted by Diane Cunningham, Certified Life Purpose Coach with Pathways To Purpose Ministry. Theme music is "Unwritten" by Natasha Bedingfield. Special Thanks to Clifford Sound for providing the bandwidth for this podcast!! Coffee Conversations: Episode 38-Lead Me When You Need Me. Hosted by Diane Cunningham, Certified Life Purpose Coach with Pathways To Purpose Ministry. Theme music is "Unwritten" by Natasha Bedingfield. Special Thanks to Clifford Sound for providing the bandwidth for this podcast!! Coffee Conversations: Episode 37-From Mess to Miracle. Hosted by Diane Cunningham, Certified Life Purpose Coach with Pathways To Purpose Ministry. Theme music is "Unwritten" by Natasha Bedingfield. Intro provided by Lans Hobart of the Enlighten Up podcast for PodcampSA. Special Thanks to Clifford Sound for providing the bandwidth for this podcast!! Coffee Conversations: Episode 36-Surprised By Spring. Hosted by Diane Cunningham, Certified Life Purpose Coach with Pathways To Purpose Ministry. Theme music is "Unwritten" by Natasha Bedingfield. Special Thanks to Clifford Sound for providing the bandwidth for this podcast!! Coffee Conversations: Episode 35-Moments Of Our Life. Hosted by Diane Cunningham, Certified Life Purpose Coach with Pathways To Purpose Ministry. Theme music is "Unwritten" by Natasha Bedingfield. Special Thanks to Clifford Sound for providing the bandwidth for this podcast!! 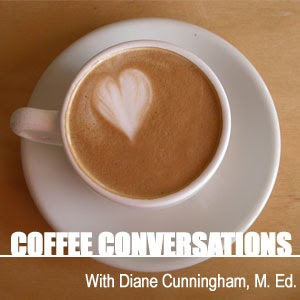 Coffee Conversations with Diane Cunningham, Certified Life Purpose Coach. Various topics that arise while drinking a cup of java! !